What can we say about kimchi that hasn't already been said? Kimchi is the staple Korean ferment, made and consumed in vast quantities not only in Asia, but increasingly, in the west. 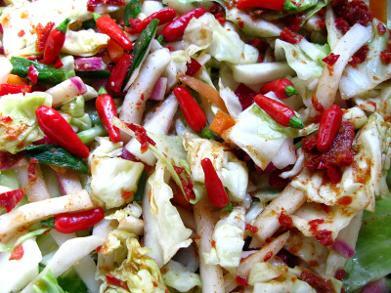 Kimchi is health giving, can be fermented in fairly short order, and the taste is addictive! The technique is the same, no matter what the ingredients. Here is a fairly standard traditional kimchi using easily obtained ingredients. 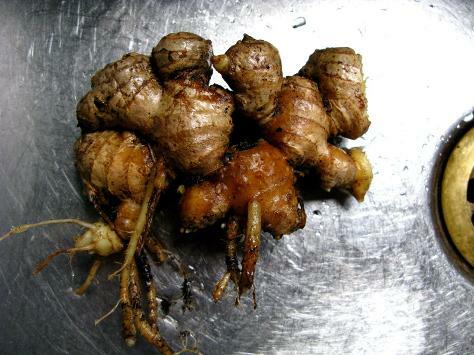 I prefer always at least to have daikon radish, but any radish works well, as do all the cruciferous roots (e.g. kohlrabi, turnip). The fish sauce, and the brown rice flour may be ommitted, and leaving out the chilli and cayenne pepper makes a kid friendly version. 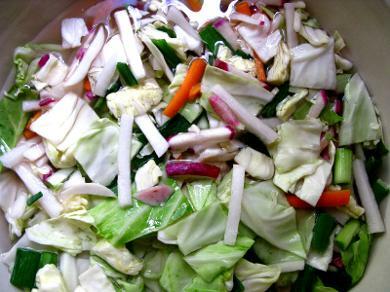 OK, to begin: chop the cabbage into good size bits, 2 inches x 2 - 3 inches, cut the radishes and carrots into thick juliennes, and slice the spring onions, including the greens into 1 inch pieces. Put this all in a bowl, cover with brine, then place a plate over the vegetables to keep them submerged beneath the brine. Leave to soak for 24 hours. Chop the ginger and two whole heads of garlic (yes heads, not cloves, lots of garlic), add to a food processor with half the fish sauce and blend to a lumpy paste. Drain the brine off the vegetables, reserving it, and rub the lumpy ginger/garlic paste well into them. Massage well, get the flavours in there. 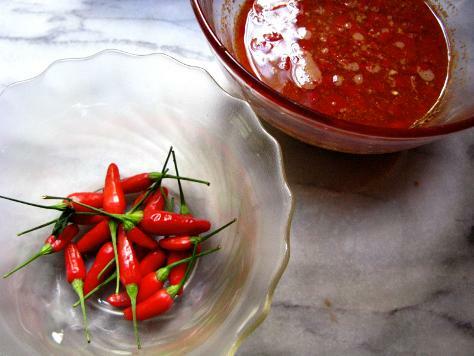 Take the six large chillies, deseed them, and put the flesh in the food processor with the rest of the fish sauce, the rice flour, the cayenne pepper, and a little brine. Blend into a lumpy paste. Cut the stalks off the small chillies. Rub the chilli paste into the vegetables, and mix it in well. Make sure you wash your hands very well after this step, especially before touching your face or perhaps even more sensitive body areas. Add the small chillies and seaweed (wakame) to the bowl, and mix well. Leave to sit, covered with a cloth while you sterilise your jars or crock. These were placed in jars so the kimchi will be ready in as little as two weeks. Jar ferments happen a lot more quickly. Otherwise, a crock is fine. Here, I have made one jar out of grated ingredients (right of picture below) so it will ferment even more quickly. The vegetables are spooned into the jars and rammed down hard so the matter is compacted. This will usually express enough brine, but if not, top up with the reserved brine. These jars have the glass insert of a Kilner jar lid as a weight, use whatever you have to fit the vessel you are fermenting in to keep the veges below the surface of the brine.